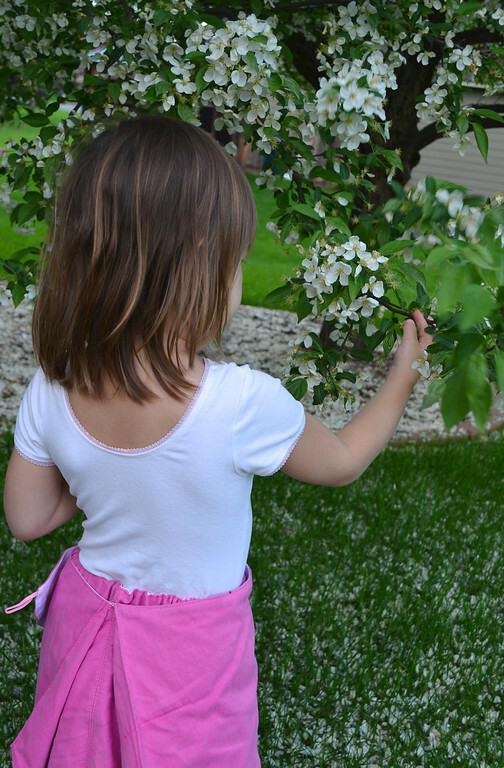 It is no secret that, even though I sew, I prefer to buy clothes for my kids. 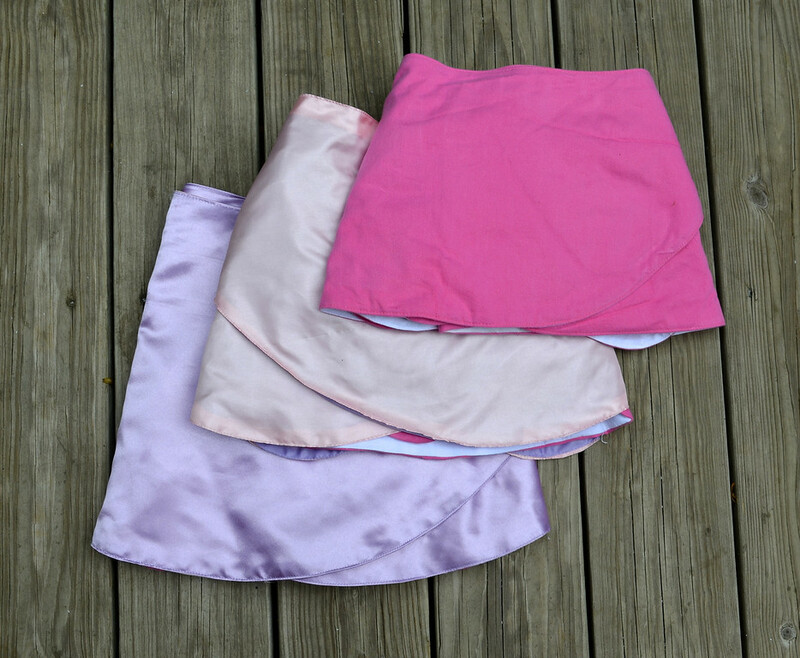 Lots of reasons: it saves time, they're rarely more expensive than raw fabric (I'm picky about my fabric), sewing in multiple sizes is boring, and I'd rather go to the park or sit with my husband at the end of the day or make cardboard stuff, really. Costumes, though, I prefer to sew. Lots of reasons: they're very expensive, the workmanship is shoddy, the fabric is scratchy or inappropriate in other ways, sometimes they're immodest, often they're only toddler-sized, and the fit is so poor that I can't even bear to look at the models in the photos, let alone my own children in them. A couple of months ago, we were minding our own business in Target, and we saw a very cool costume. It was plasticky and stiff and expensive, but it was clever. And even though it was sized for someone half her age, Emily wanted it. We had dress-up wings at home but they were the nylon-stretched-over-a-wire-frame type that have already disintegrated, not to mention never flapped or actually stayed in place. This one, I reasoned, would therefore be quite a different -and probably longer-lasting - addition to our wing arsenal. So I stared at this clever plasticky winged skirt for a long time, deconstructing it in my head, and then went home and (slowly) made our own. However, by the time I finally got around to drafting them, I'd forgotten how the original ones looked, so I did whatever made sense to me or that I could remember. 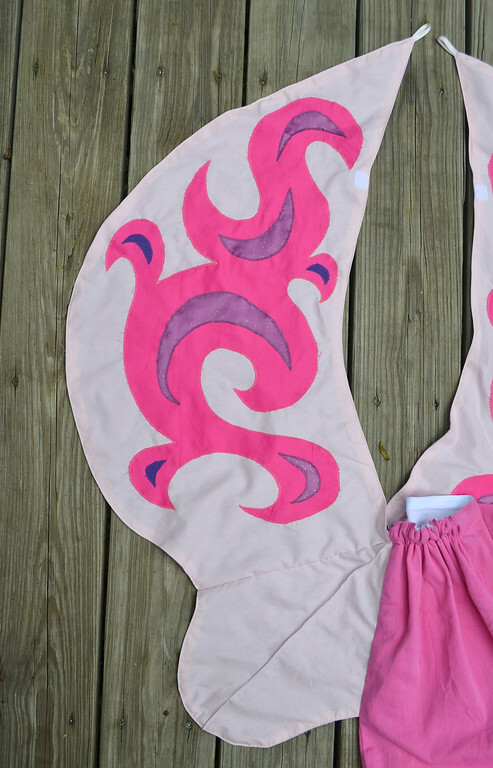 See more photos of the finished wings here. to spread them as wiiiiiiiiiide as they wanted. So each pattern had to be custom-drafted. It was not as nasty as it sounds. First you do a fitted A-Line skirt draft for the front. The yellow arrow is a quarter of the exact waist measurement. Then you do a gathered-skirt draft for the back i.e. it's a rectangle. The greeny-yellow arrow is one quarter of the hip (including some comfortable ease) measurement. Then you make sure that the length of the back piece matches the slanty side of the front piece because they're going to join each other at the side seam of the skirt (the yellow arrow). And that's the pattern for the skirt! Easy. Here's an old tutorial that is very similar, if you need more instruction. The wing was a bit more fun to do. 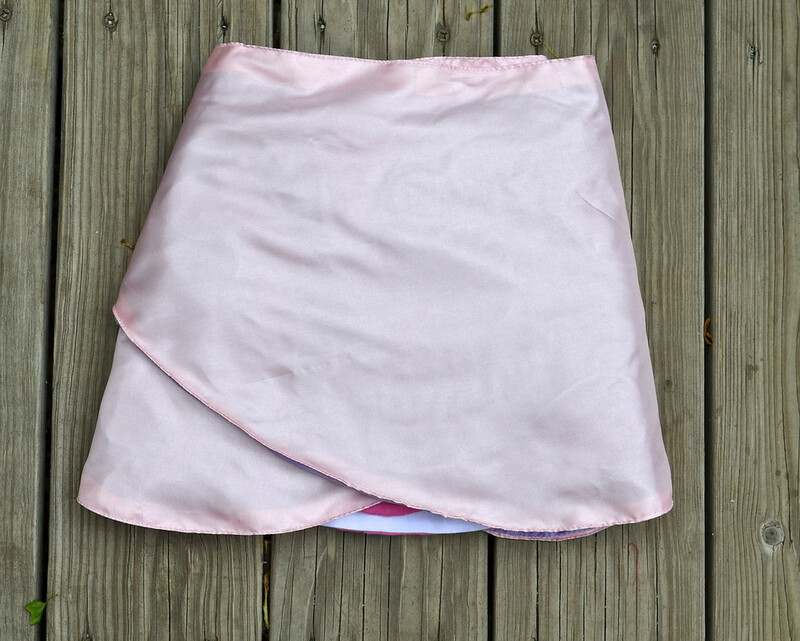 (ii) it folds into itself and wraps around the entire skirt. So it's wing-shaped while being skirt-shaped. 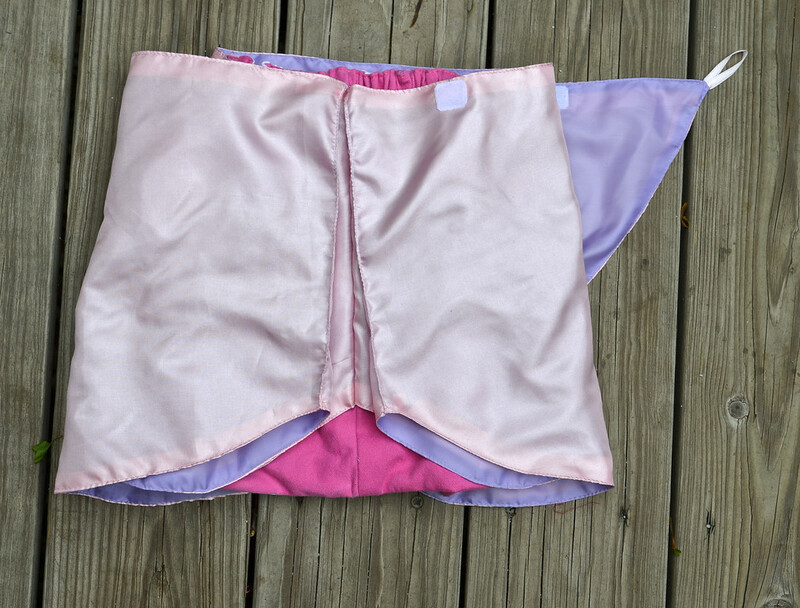 It's also slightly differently-shaped for each wearer, depending on the shape of their skirt draft. The red section is the part of the wing that wraps around the front of the skirt. 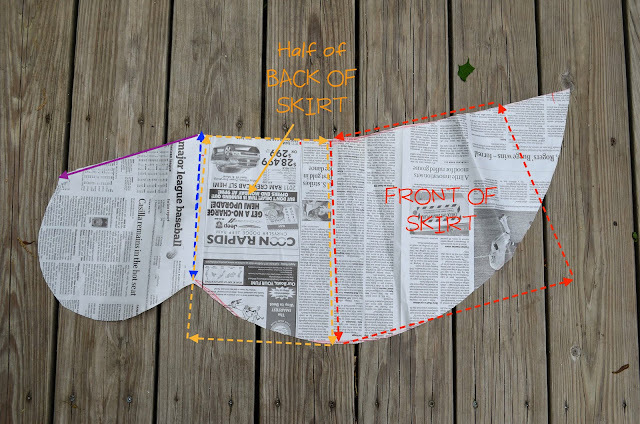 You draft it by tracing around the whole front skirt pattern. The yellow section is the part of the wing that wraps around half of the back of the skirt. The other wing wraps around the other half. Note that by "back of the skirt" here, I mean "after the elastic has been inserted, so that it fits the back waist. 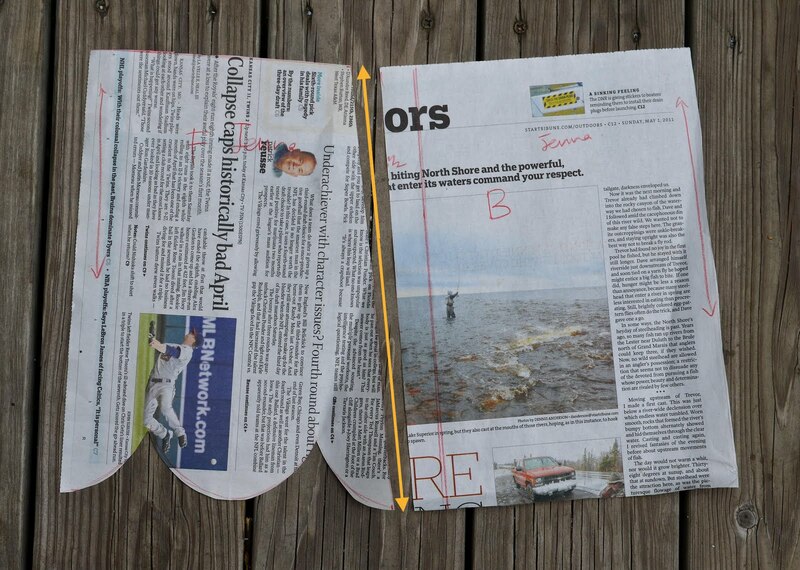 Another way of drafting this section is to trace the half front skirt pattern, which has this fitted waist. 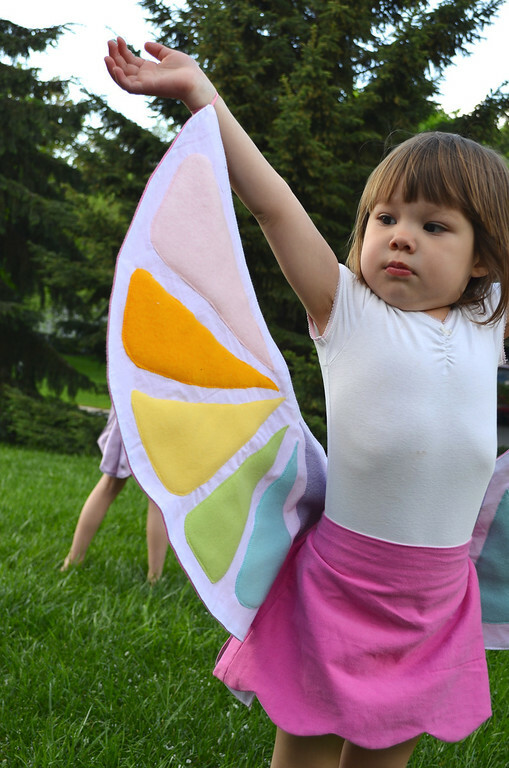 The length of the wing is found by measuring your child's armspan. 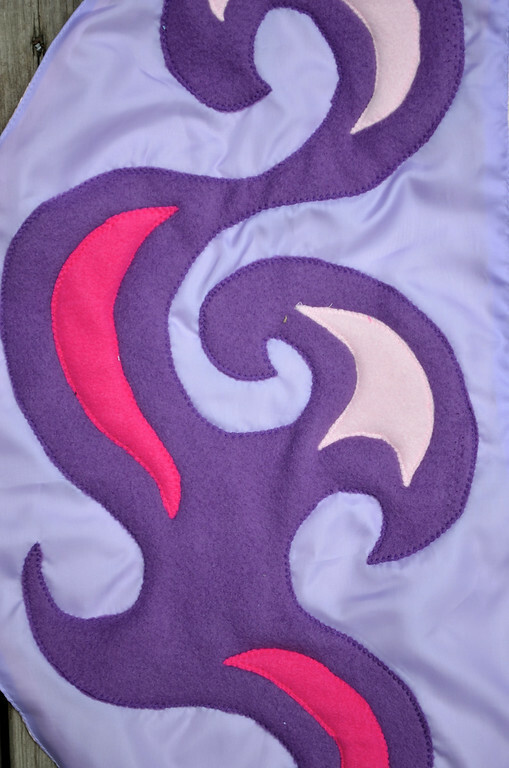 The purple arrow is the edge that actually gets sewn into the back center seam. 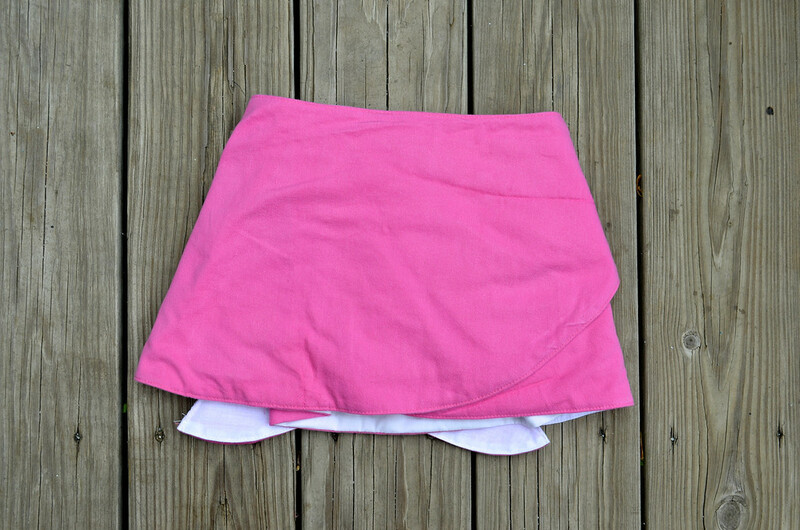 for wrapping around the skirt. 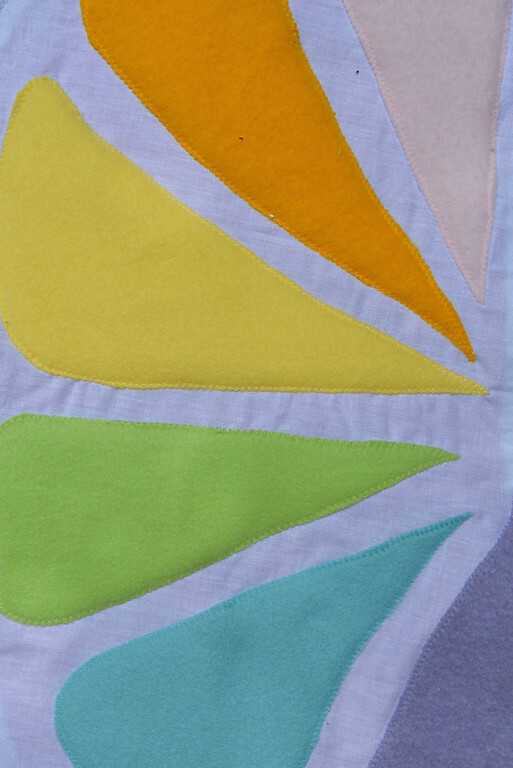 and fleece or cotton for the applique. 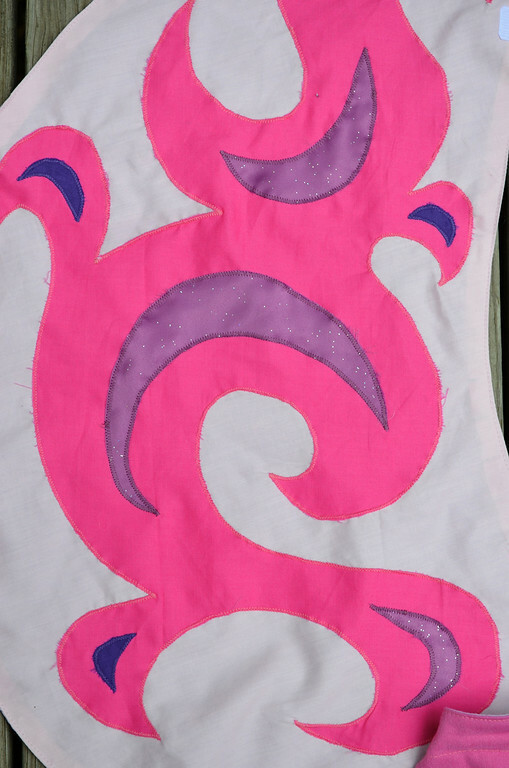 To make the applique patterns, just sketch directly onto the wing pattern when you're done cutting out the fabric pieces until you get something you like. Then cut the paper pieces out and use those for applique patterns. I made the mistake of inviting suggestions from the kids - I thought they would just pick their own colors for the radial rainbow design but - alas - they wanted swirlies. 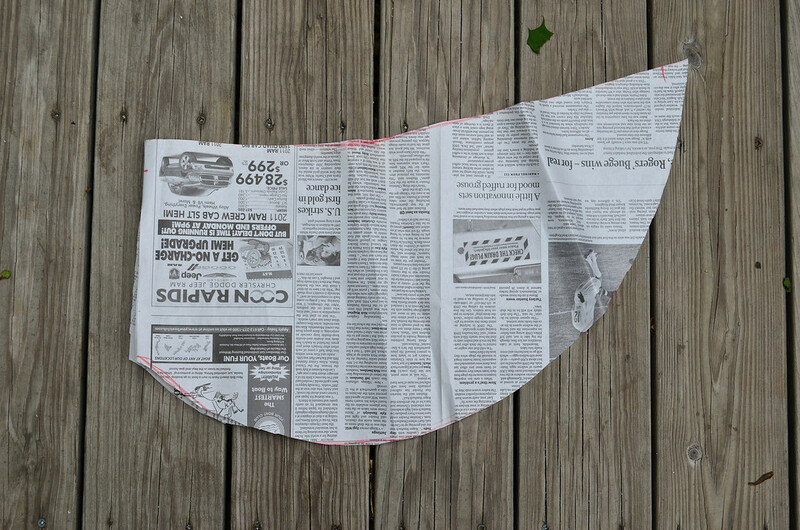 To get the lower lobe to fold nicely, you can sew down the pleats, pin-tuck style. 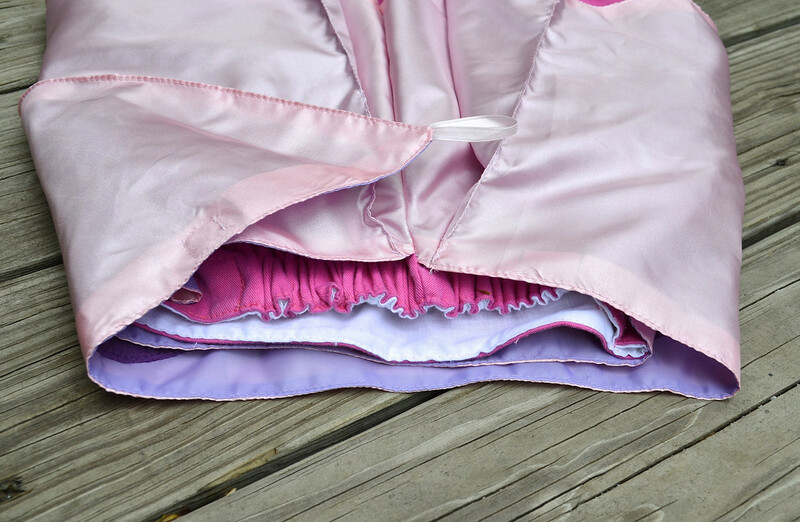 The wing tips have ribbon loops to fit over fingers, and the skirt fastens with little velcro squares. 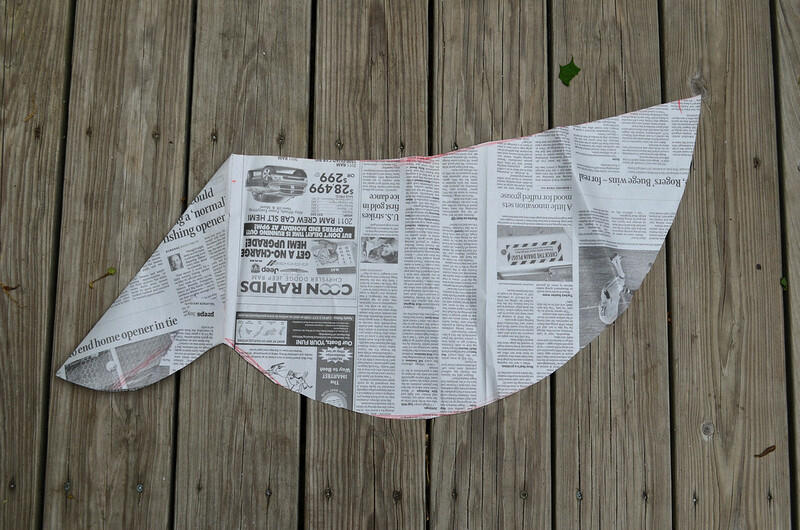 Incidentally, I drafted these on newspaper because the wings were so big, and also because I like to throw away my patterns when I'm done with them. I dislike saving patterns because they take up so much space. Also, the girls grow and change body proportions so rapidly that the old patterns are practically obsolete anyway. I reckon that they're already in my head and I can always redraft them if I need to (not that I'm planning to make more of these wings). I was just about to crush these templates up and throw them in the trash when I wondered if any of you might want them. If so, I can put them in an envelope and post them to you. My only condition is that you use these patterns for your own, non-commercial projects. Leave a comment to let me know which one you want. If there is more than one interested person per pattern, I'll turn this into a giveaway and draw one name at random for each pattern by the time I write my next post. FYI: Emily is a very tall, slender 6.5 year old (i.e. she's more like a 7+ year old with a 6-year old's waist). Jenna is tall 4.5-year-old and Kate is 3. I don't remember their waist measurements which seem to change with each meal anyway. And I'm not providing instructions with the patterns, or seam allowances or symbols or anything like that. 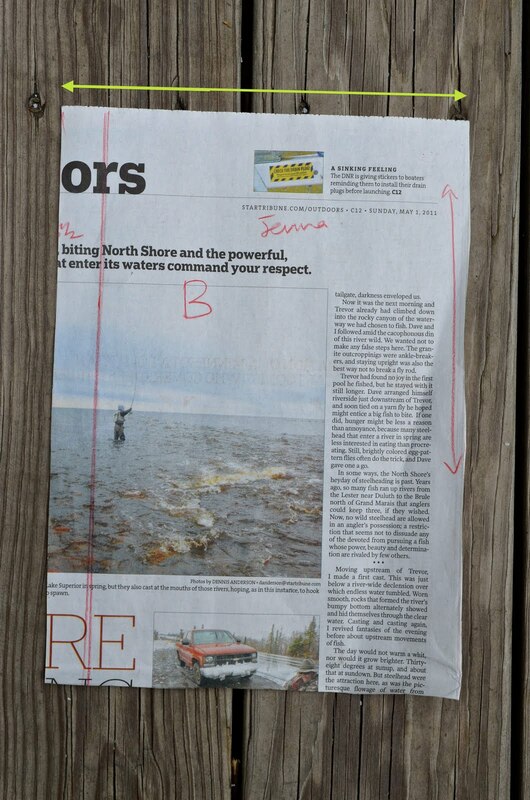 You get just three pieces of newspaper, and you can wing it (Oo, bad pun) from there, OK? These are AMAZING!! I have daughters who are the same size/age as Emily and Kate and would happily accept either size pattern! Thank you SO MUCH for all of your awesome patterns/tutorials!!! I'd be delighted to take the pattern you used for Kate off your hands! My daughter is 4, but tiny, so I'm sure I could make it work! :-) She'd probably crown me best mother of the universe if I made her a winged skirt like this! While I'm commenting...here's a story I think you'll appreciate. She has a Jessie the Yodeling Cowgirl doll. She's obsessed with Jessie. She carries her everywhere. The other day she looked at the bottom of Jessie's boot and said, "Mama, why does it say 'Made in China'? She's supposed to be 'made in the Wild Wild West'!" Oh my goodness, adorable! 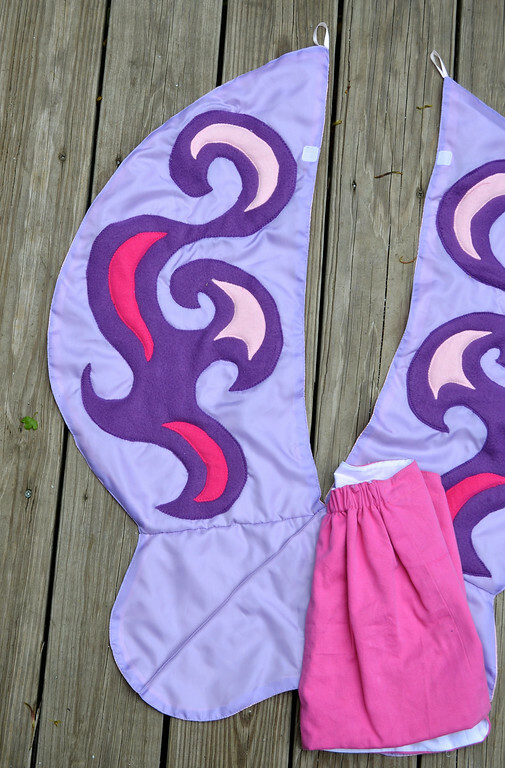 I would LOVE the pattern for a 3yo (my DD turns 3 in November and I'd love to make her a costume for her birthday). I wish I could just look at an outfit and make it myself (my mom was like that, and apparently it's not genetic). ohhh... I would LOVE them! That is all the ages of my nieces! So much fun to make them for them!!! Awesome project. What a beautiful result. PS I'm international, so I'm happy to send you $ for postage. beautifully told. Thank you very much. Ooooohhhh it would be great if I could have Emily's pattern as thats between my 2 girls and I stand more of a chance of making one for the youngest and can grade down. Thanks for such wonderful patterns, I gushed enough yesterday so I'll quit now! These are beautiful and make me wish I was brave enough to try for a girl after having 2 boys. Oh I would love one... Jenna's would probably be the best fit for Violette. I just love the idea. Very well done, as usual of course. I am so blown away by this, it is unreal. I don't knot yet if I have the guts to try it...I will be thinking about it over the next few days and make a decision. It would be the absolute perfect birthday present for my 5 year old daughter - that, and the A Frame tent I am seeing everywhere. Maybe a handmade birthday this year, wouldn't that be wonderful?! Ahhh - these are awesome! I would LOVE to use your pattern to make my niece a costume! She's 40 lbs and 40 inches...so I think she'd probably be more Emily's size than Jenna's size, don't you think? 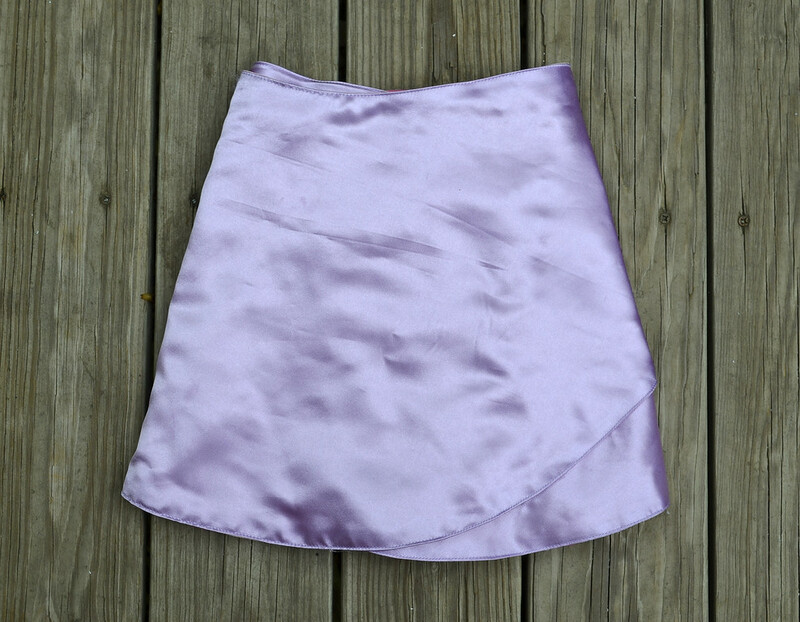 These skirts are beautiful and so fun. When I first saw them closed I thought they were tennis skirts. I would love to win Emily's sizing! I would love a pattern in size 3! So freaking cute. 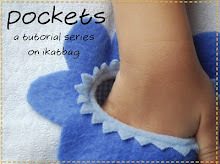 I have absolutely no skills in sewing so use of the pattern here. but i did want to comment on this post and say how gorgeous those wings are. Ur girls are really lucky to have such a creative momma!! Oh I would love Jenna's pattern! It would save me from any crazy attempts to draft this myself! I love one for the 4.5 year old size! Thanks so much for these instructions - my daughter saw me reading this and said "I want some wings like that." So, I'm thinking Christmas present! 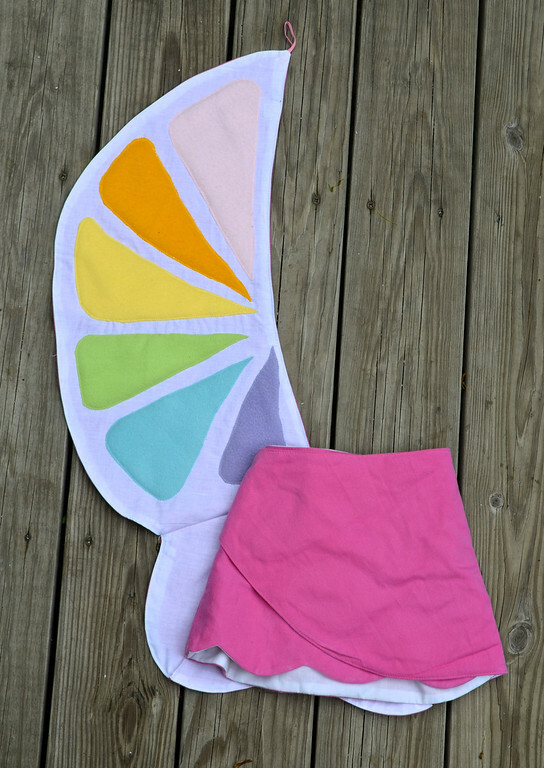 I have a 2.5 year old who is very into butterflies and ballerinas and this would be perfect for her! I would love to use your pattern. Thanks! 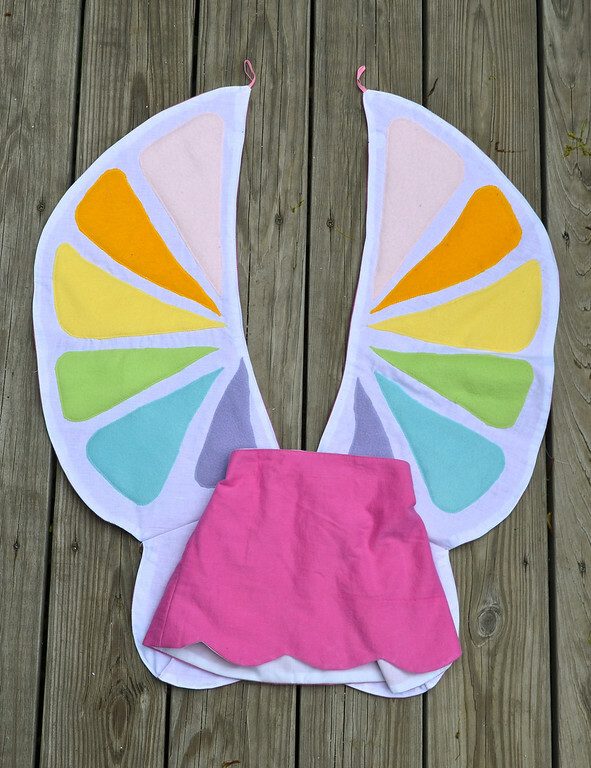 I recognize those wings - we found some for a gift for a friend (which is the only reason I bought them) and wished I knew how to make them for my very tall, 6 year old. I would Emily's wing pattern. I absolutely love this. I can't wait to try it for my 4 year old! I would love the sized 3 pattern. If you wouldnt mind. 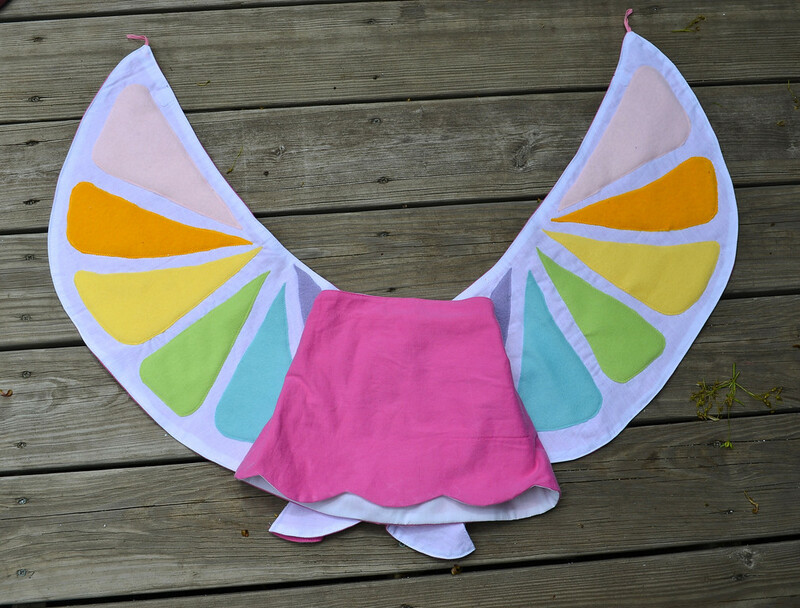 If not maybe I will ask my daughter to try making one for little G. I wonder if a mommy could take a pre purchased skirt and add the wing part? This is such a cute idea. If I only had girls. Maybe I can try to figure out a way to make this more boyish. (NO SKIRTS, LOL) Thanks again for sharing such a wonderful idea. I would love to have either Jenna or Emily's drafted pattern. My girls would lose their minds if I was able to make these for them! You are beyond amazing! Jenna's pattern would probably fit fairly small and very slender Emma, and Kate's would probably fit the amazingly tall Lily, so I would love either of those! Thank you so much for the tutorial! Hopefully I can still work this out if I don't win, because I think my girls (and several of their friends) would LOVE these! I would be thrilled with the pattern for your three-year old. I have loved your tutorials and my little princess has enjoyed the products of several of them already! Thank you for sharing such wonderful costumes. 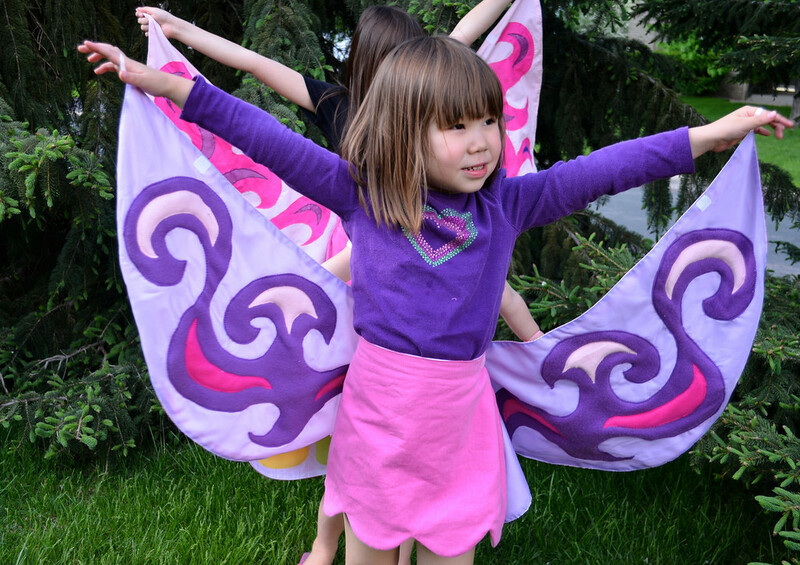 I'd love to throw my name into the giveaway for the 3-year-old pattern - LOVE the winged skirts, they are just perfect. I would love the 6.5 year old one! My daughter is such a lover of anything fairy. We are in MN too. I loved the princess costumes you did out of fleece and totally understood :) So nice of you to think of everyone else before throwing them out! I saw those skirts at Target and thought "I can make that". Now I don't have to figure out how :) Thank you for sharing! Oh my goodness. I would love the pattern for Kate's skirt/wings. My daughter is 3. I have a healthy 4.5 year old boy and I'm thinking Dragon wings! Or maybe a Dino . . . Now wouldn't that be a nice change? I would love the pattern for the smallest of the three. I have a daughter who is just starting to become interested in dress up and these would be an amazing addition! What fun for a child! 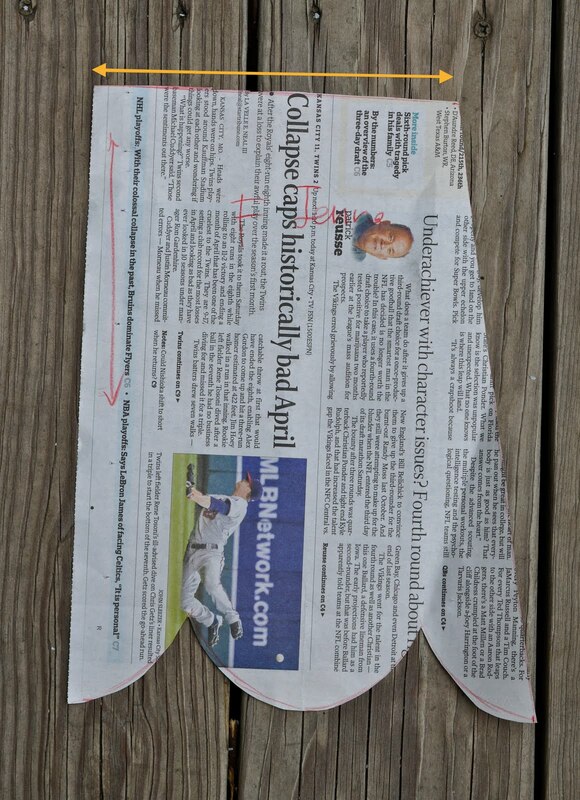 My granddaughter is 6.5 and shaped the same as your Emily. 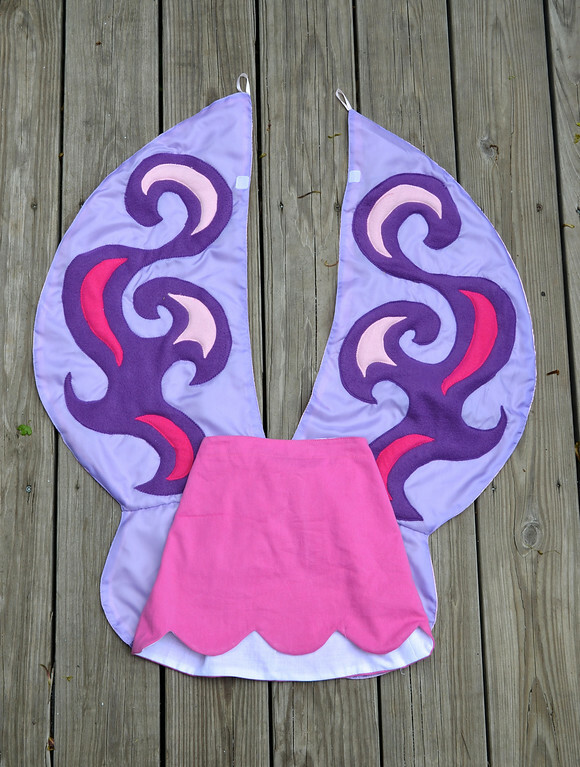 I am about to do some sewing for her and would love to surprise her with a butterfly skirt. Thanks for offering your patterns. 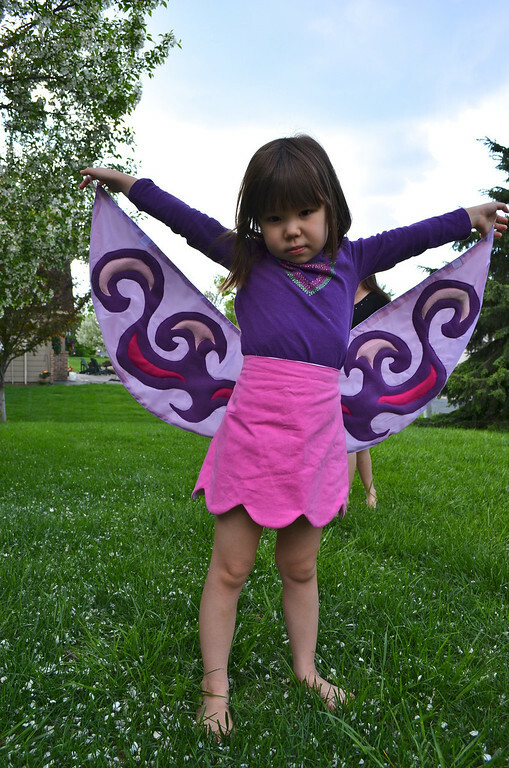 I have a very girly girl who decided that she NEEDED a skirt that turns into wings! So I guess I know what I will be doing this weekend. These are wonderful! I love the wings, you are so creative. Thank you for posting this, so lovely as are your daughters. 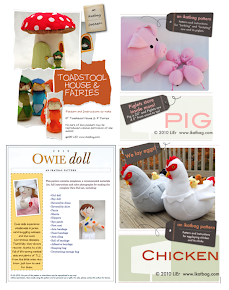 Thanks for sharing your sewing ideas and a little touch of your family. I sew myself and I feel such a shared sisterhood between all these women sewers I know only via the internet...Hurray for technology and sewers and women and moms!! Oh so cute, I would love the butterfly one if I am lucky enough. This is so sweet and clever...perfect and such a wonderful alternative to store bought. oh I would love the 3yr-4yr old size! I have a few girls birthdays in that age range coming up this summer! and my own girl included! Heloisa, I'm sorry but I no longer have the patterns. I gave them away during the giveaway last year. I wonder why I´m still searching with Google, when everything I´m looking for can be found on your blog! 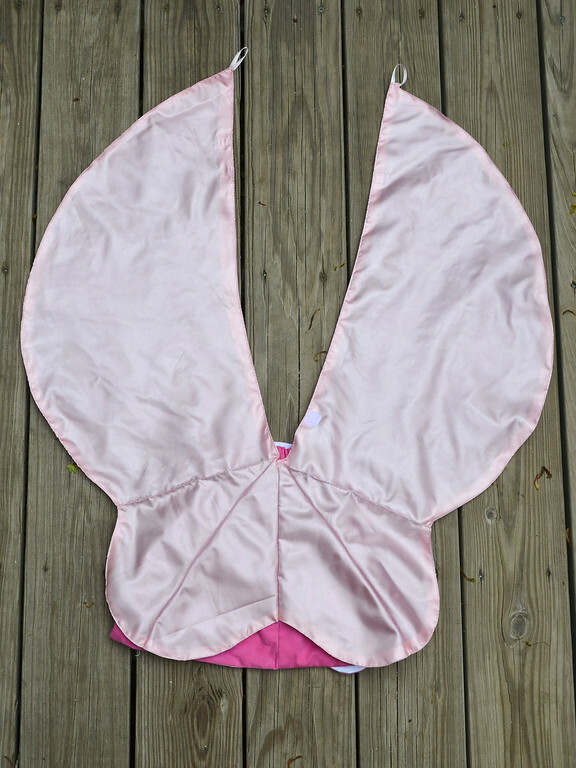 Yesterday my daughter asked for a mermaid costume, today I´m looking for wings. And again I end up here. Your girls are so lucky to have a mother who makes wishes come true! I love these skirts!! I'm going to attempt to make them for Halloween costumes for my girls, ages 4 and 1. I was wondering if you could answer a couple of questions. I appologize because I know its an old post. I hope you can help. 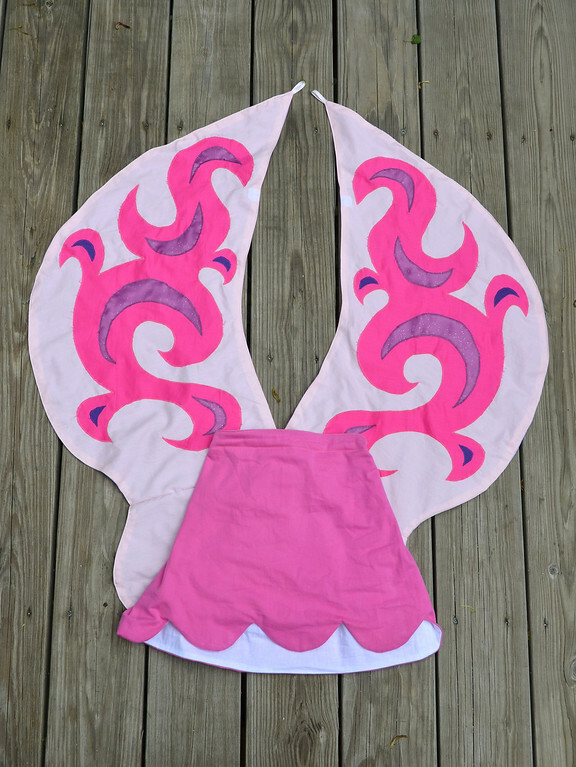 Are the skirt and wing pieces fabric doubled up then top stitched around? 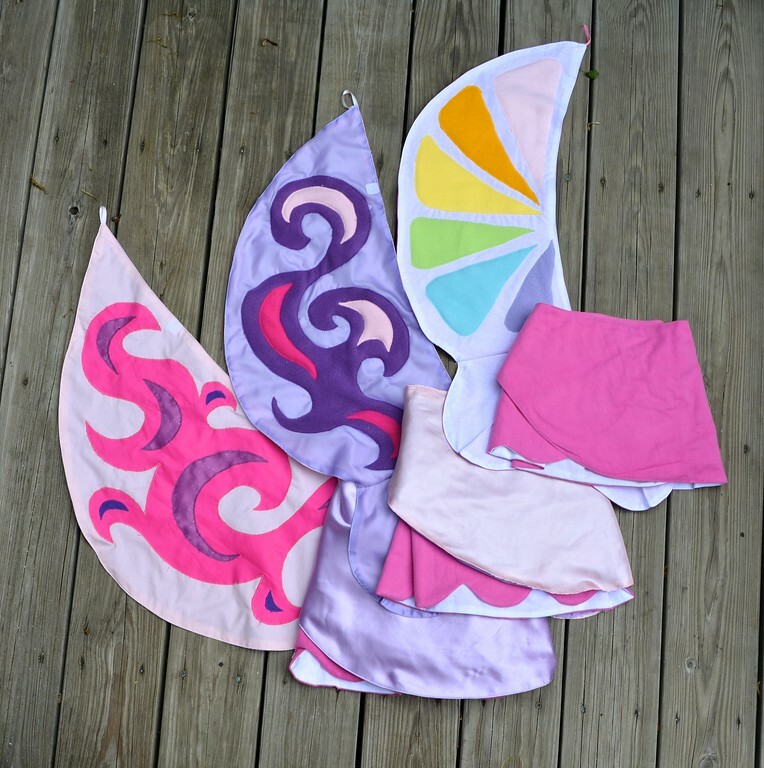 If so what fabric did you use for the lining of the inside wings? If not, did you serge the ends? Also how much material should I plan for a size 5 and size 2t girl? I hope you get my message and thanks for the great idea!!! I didn't read all the comments so I don't know if you gave away your patterns, but I hope someone had the benefit of your tremendous generosity! How kind of you to even think of giving away your awesome creation!! I just found your tutorial on pinterest, it is wonderful and well done, and I will be recreating your fabulous wings for my four-year-old granddaughter. When I showed her the pictures she wanted to know if I would be making the wings out of thread (what she calls fabric) and I assured her I would. She loves wings, but I agree that even the more expensive plastic ones (that attach over the arms) just don't work well or last long. Thank you again for the great tutorial! !